Very Limited number available. One deck per customer only. 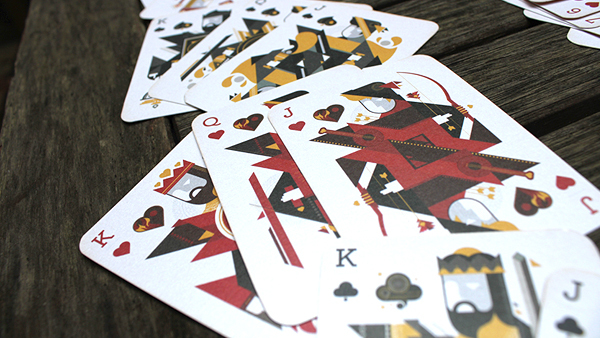 In putting this custom deck of playing cards together, we incorporated the symbolism and philosophies surrounding Classical Greek Elements: Earth, Air, Fire and Water. Once we began digging into the rich history of these concepts, it was clear the only way to do it right was to allow each traditional kingdom – Hearts, Spades, Diamonds and Clubs – to represent a corresponding element. So Earth took Diamonds, Air,Clubs, Hearts became Fire and Spades, Water. Traditional icons are incorporated into the face cards as well as new embellishments like Latin text and the complex visual language of the elements. 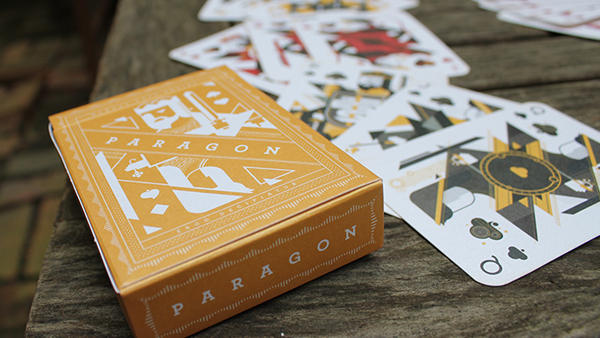 The backs of the cards feature a graphic pattern created using Paragon’s logo mark. Both the deck and custom box were printed on Shine paper. For the full design scoop, read James’ blog post.